Pamplona is a city in Navarra, Spain that has become famous around the world for the San Fermin Festival, which is held every year in July. This festival features the famous "Running of the Bulls" ("Encierro" in Spanish). Even if you're not in town for the festival, there is still plenty to see in do around town. 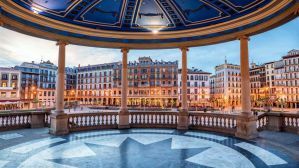 Pamplona is the first main city along the Camino de Santiago and it has a beautiful medieval center that has impressive museums, restaurants, and parks. The city also has two major universities, so there is a young population of students. Pamplona has become one of the most expensive cities to visit in Spain, and accommodation is no exception. Hotels, hostels, and guesthouses can stay expensive year around, but if you're in town during a peak period, the prices are even higher. There are several good hostels around town, and if your priority is to save money, then these are likely your best option. How much do hostels in Pamplona cost? Aloha Hostel is a nice backpacker hostel that's located in a charming building that has a lot of character. It's conveniently located right in the heart of Pamplona and is just a short two minute walk from the bus station and old town. It's centrally located so it's easy to explore the area and you'll find many great restaurants and cafes nearby. The hostel has double private rooms as well as four, eight, and ten bed dorms. This is a fun and relaxing place to stay where it's easy to meet other guests. There's a small and basic kitchen that guests can use to prepare basic meals, but there's not really space to cook anything elaborate. There's also a nice terrace and comfortable common area where guests can hang out. A great hostel for San Fermin's Festivals and the Running of the Bulls. Hostel Hemingway is one of the first hostels opened in Pamplona. It's been renovated and is a popular and fun place to stay right in the historical heart of the city. If you're in town to enjoy San Fermin's Festivals and the running of the bulls, then this is an ideal location. It's just a three minute walk from the bullring so you don't need to take public transportation or a taxi, which can be chaotic. The hostel also has all of the standard amenities for guests including a shared kitchen, a lounge area with cable television, public computers, a mini bar, and a reading area. There's a complimentary breakfast buffet every morning as well. Whether you're traveling alone or with a group of friends, then this is a fun and social place to stay. It's also surrounded by many great restaurants and clubs so you won't have to go far if you want to go out on the town. This hostel has two dorms that sleep six people and three dorms that sleep four people. There are also two private double rooms that have their own flat screen tvs. Hostel Ciudadela 7 is also located in the historic city center of Pamplona. You'll find most of the city's top tourist attractions within just a short walk of the hostel, and there are many restaurants and entertainment venues nearby as well. If you want to try traditional cuisine then you won't have to go far. This is a friendly place to stay where it's easy to meet other travelers. It's clean and quiet, so you should be able to sleep well, but it's also a nice place to relax with other guests and swap travel stories. Breakfast is not included in the price of the room but there's a basic kitchen where you can prepare food. The hostel has six bed dorms that are clean and comfortable. The staff is friendly and helpful and this is a pleasant and affordable place to stay. Xarma Hostel - Aterpea opened its doors in Pamplona in 2013. It's a pleasant place to stay with a nice lounge and living room where guests can relax. The lounge has sofas and a public computer. There are also books and board games that you can use. Many guests enjoy hanging out in this area and meeting other travelers. Guests also have access to a shared kitchen where they can prepare their own meals. If you want to go outside, there's a nice terrace and garden area where you can soak up the sun and sip a drink. The rooms here are clean and comfortable. There are dorms that sleep either four or six people and private double rooms that use shared bathrooms. The staff here are nice and respectful, and they go out of their way to make sure your stay goes smoothly. If you're looking for a centrally located and affordable place to stay in Pamplona, then this is a good option.